What Secrets Is Your Passport Hiding? Electronic passports are always including more and more sophisticated security features in their designs in order to ward off potential counterfeiters, fraudsters and impostors. Of course, this is a very good thing. Here, Passport Index takes a look at the various security features of modern passports. Holographic images are a staple of passports today and perhaps the most recognized passport security feature because they are visible to the naked eye. Holograms are three-dimensional images on the various pages of a passport, most notably the information page. Holograms are known as structure features according to the International Civil Aviation Organization’s Doc 9303 “Machine Readable Travel Documents,” which forms part of the ICAO’s traveller identification management strategy. Structure features contain verifiable information based on their physical structure and can be read by a machine for authentication purposes. The Canadian passport famously features holograms of scenes from Canada’s history that are only visible under UV light. Electronic passports, or epassports, also feature a chip containing the passport holder’s photo and identification data that is embedded in the last page of the passport. UV dull paper is a special kind of paper that does not reflect ultraviolet light. This means that the UV ink will not appear on the paper in regular light and can only be viewed under black light. A watermark is a design formed in the paper, typically using a tonal gradation, that is visible when held up to the light. Passport printers may use a different watermark for the data page and the visa pages of the passport in order to thwart those who would attempt to replace the data page. Modern passports also include what is known as optically variable ink. This is ink that changes colour depending on the light used to look at it. Optically variable inks are substance features according to the ICAO’s Doc 9303 and are also machine readable. 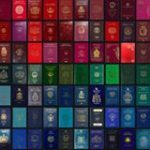 In fact, passports make use of special printing techniques as well as custom inks, threads and papers to make them next to impossible to forge. An anti-scan pattern is an image made of fine lines at varying angular displacement in the background design of the passport paper. This security feature is not visible to the naked eye. However, when the passport is scanned or photocopied the anti-scan pattern becomes visible. This helps thwart those who would attempt to forge a passport. A Guilloche design is a pattern of computer-generated fine lines that forms a unique image. This image can only be reproduced with access to the original software and parameters used to create it in the first place. Similar to the anti-scan pattern, the Guilloche design is a security feature meant to make it impossible for forgers to copy a passport. Special font and font sizes are also a staple security feature of modern passports. These can be especially difficult to replicate as they can include deliberate errors. Some passport pages may also include font that is so small it’s not even visible under a microscope. According to Gizmodo, printing techniques and type are the most difficult security features to replicate. Electronic passports may include encoded data that are invisible to the naked eye. For example, the passport number may be encoded and stored on special security threads in the passport that can only be decoded using the proper machine reader. Such hidden information adds an extra layer of security to the passport. Invisible fluorescent fibers are a substance feature embedded into the paper used to make passports. These fibers are only visible under UV light and as such do not appear on photocopies. A chemical sensitizer is a special chemical mixture that is used in passport paper to prevent tampering. For example, if bleach or other solvents are poured onto the passport paper in an attempt to alter them, then irreversible colours will develop on the pages due to the chemical sensitizers. Tactile security features are those that are perceptible by touch, giving the document a certain feel or texture. An example of a tactile feature is intaglio printing. Intaglio printing is the process of creating a relief print or image with a tactile feel on the paper. Passports also use a special sewing technology to bind the booklet together. The method is such that if someone tries to take the booklet apart it will be obvious that tampering has taken place. Sewing threads may also be UV fluorescent as an added security measure. What Are the Different Security Threats to a Passport? Passport-issuing authorities are encouraged to use a combination of security features in order to make it difficult or impossible to produce counterfeit or forged passports. The following are the most common ways passports can be faked. Alteration of data on the passport’s data page. Removal or substitution of certain pages. Theft of genuine passport blanks. Impostors: someone using a genuine passport who is not the official bearer of the document but who looks similar to the bearer. Next time you’re travelling, be sure to appreciate all the impressive security features in your passport that let you travel safely and freely.